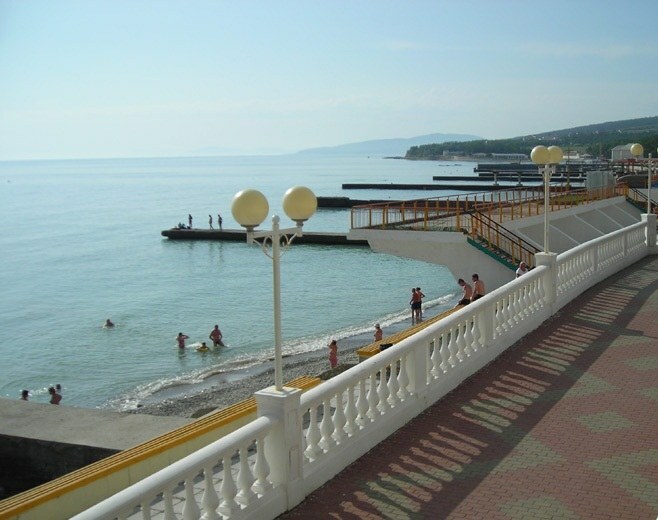 Airport – a small resort village located on the Black sea shore near the Gelendzhik. Every year it becomes more and more attractive for those who prefer a relaxing holiday and the lack of a large number of people. This place is especially suitable for couples who came to sea with children. If you do not live in the Krasnodar territory and decided to get to the Airport by plane, the closest airport is located in the city of Gelendzhik, which is located 10 km away. In winter, Noumea planes fly only from Moscow and St. Petersburg, and the summer schedule is much more diverse: it is possible to find Ekaterinburg, Kazan, Saratov, Nizhny Novgorod and other Russian cities. To arrive by plane is also possible to Krasnodar or Anapa, and from there to get to Gelendzhik by bus. Of these cities the bus to Noumea can be reached within 4 and 2 hours respectively. From Noumea to the Airport via public transport. Buses every hour and a half leave from the old bus station, and 20 minutes drive from the village centre. From Central market with the same frequency there is the taxi. Those who want to come to the Airport by train should buy tickets to Novorossiysk or Anapa is the nearest train station. From the train stations you should get to the bus stations in these cities, where to Noumea regular buses. Those traveling by car, keep in mind that the Airport is from the M4 Federal highway. Passing on her Gelendzhik, after 5 km you will see a sign "Airport", after which you should turn right and drive another 5 km to the village. If you will go by automobile transport from Tuapse, Dzhubga or Hot key turns the Airport will be on the left side, immediately behind the town of Bright, located on the highway. Do not fall victim to too mercenary privateers, a business of carting in the area of Gelendzhik bus station, take advantage of the many city taxi. In this case, you will be able to reach the Airport from Gelendzhik two times cheaper. In the summer, especially in August, to rent a room or apartment in Divnomorsk it's almost impossible for the owners of hotels and private owners all seats are booked in advance. Use the booking online. Divnomorskoe - a town in the Krasnodar region of Russia. 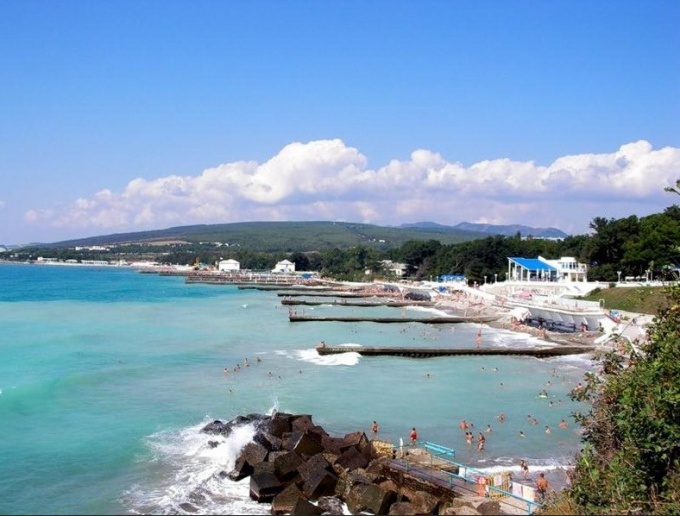 He refers to the city-resort Gelendzhik. Divnomorskoye is located right on the Black sea coast. If you stay in Divnomorskoye, be sure to take a trip to the ancient monuments: the dolmens. Dolmens are large stone plates, stacked on top of each other. The age of the plates reaches 10 thousand years. Archaeologists still have not established who and what was collected these designs. There is a theory that the dolmens or stone houses are the places of burial of the dead. According to other conjectures, in these blocks locked the main people of the time, so no one could use their knowledge. Adygei also put forward his theory. They believe that the boulders provided protection from the giants that once existed on our planet. Anyway, the surviving dolmens testify to the fact that the ancient civilization was strong and highly developed. To view all the dolmens, you need to go on an excursion by jeep early in the morning. If you plan to visit the dolmens only in Divnomorsk, two of them located before the village on the right Bank of the river Mezyb'. Dolmens are there in a dilapidated condition. In Gelendzhik you can meet single and group of stone houses. Many dolmens are located around the village Pshada. Some of the stones have carved symbols. To feel the energy of dolmens, touch boulders. Tourists entering inside the buildings, making a wish. The temple is situated in the village of Divnomorskoye on the address: street of Kirov, 13. To this attraction you can catch a local bus or taxi. In 1997 the Church was given the image of St. Sergius of Radonezh of the Holy Trinity-St. Sergius Lavra. In addition, the Church was moved part of the undecayed relics of the Saint. In 2005 the Church was consecrated by Patriarch Alexy II. The Church of St. Sergius of Radonezh built of rough stone. Among the interior decoration you will find many of the saints of the faces. This attraction is located not far from the Airport: in the village of Praskoveevka. Near the sea stands a rock, resembling a sail of a ship. Here is the Robinson beach. You can take a picture with a turtle, archery, swim in the sea. In order to see these spots, take a boat trip on the boat. The walk will take no more than an hour. 1 km from Divnomorskoye on the left coast there is a forest with Pitsunda pines. To get into it, you need to bypass the hotel yacht club. Pine forest is an amazing place. The air is clean and fresh, and the atmosphere is filled with a special energy. It's the trees that survived several hundred years. And the grass rustling underfoot. Blue is a canyon leading to the sea. The place is amazing and beautiful. Down to the sea arranged with metal stairs. With the right and left side of the Blue abyss are camp camping. With this site you can watch beautiful sunset.